Here’s a nice example of watercolor hair. 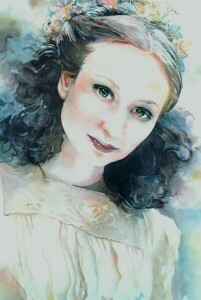 The combination of straight hair at the crown of the head, and curly loose hair around the face, helps you see two different textures and techniques for painting the hair. In this painting I’ve used Ultramarine Blue, Cobalt Blue, Permanent Rose and Winsor Yellow as my palette. 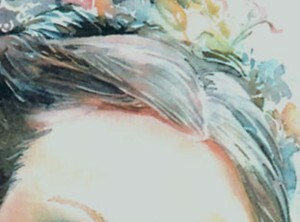 When painting hair remember that the hair is first a mass with a light side and dark side, just like any other mass. Without that consideration the hair becomes a flat object. The hair has an individual texture, depending on the person… (wiry, curly, straight, bushy, and shiny or dull). Look for sections and groupings of multiple hairs. I use lifting and negative painting to achieve these smaller divisions. Painting hair this way keeps you away from the stringy look that we usually start with as immature artists. It helps to be aware, as well, of the edges of the hair and it’s relationship to the background. Let the hair softly bleed off into the background in some areas. Leave some hard edges as well. Where the hair is dark, you might want a light background. And where the hair is light, you might want to darken the background. This play between foreground and background helps create the illusion of space. Lifting out a couple of hairs using a metal or plastic template on a dark background can be fun. If you have questions, please feel free to leave a comment. Looking forward to hearing from you. You do GREAT hair! (Not to mention the rest of the work)!!! Mahalo Jeannie! Thanks Carmen! I love your work too! Hi Robert… Guess I’ll have to post a “negative painting and lifting” demo for you and others. Thanks for commenting and keep working on hair! The more you study it, the more you’ll see and understand. I’ll be back with that post for you asap. Please do post a video on negative painting and lifting for hair when you have a chance.